This is one of those weekends where my faith in mankind is guaranteed to be shaken - not 'Adam Sandler' shaken but close enough. When a cash-grab like 'New Year's Eve' hits screens you pray that folks ignore the thing and make better choices like: 'The Artist' or 'The Descendants'. But in a land that have crowned the Kardashians queens - good luck with that. 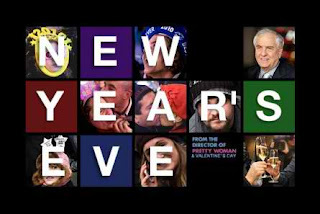 New Year's Eve ($30M) - It's 'Valentine's Day 2' - the date movie for folks that want to turn off their brains and have a slew of "celebs" wash over them. Once this one scores as expected - 'Arbor Day' is inevitable. The Sitter ($14M) - Jonah Hill's first solo headline role coming off his stealing 'Moneyball' from Brad Pitt. Essentially it's an R-rated 'Adventures in Babysitting' - that rating will temper the take. Twilight: Breaking Dawn Part 1 ($10M) - How Bella and Edward continue to hold off the family fare is rather bewildering. Twilight movies are always front-loaded but this one has stronger legs - attributing that to that lack of teen options. Arthur Christmas ($8M) - Its way early release crushed any chances of raking in massive Christmas cash. Should have been released this weekend not Thanksgiving. The Muppets ($7M) - One of the most baffling movies of recent not - it's beyond entertaining but Kermie and crew just can't seem to get anyone but Gen-Xers and older into the seats. Kids largely have no idea who they are and teens think it's all too juvenile.